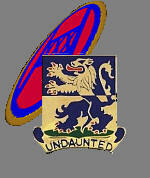 Unit: A-Company, 119th Infantry Regiment, 30th Infantry Division. It was September 17th, 1944 during the liberation of the area between Valkenburg and Heerlen. 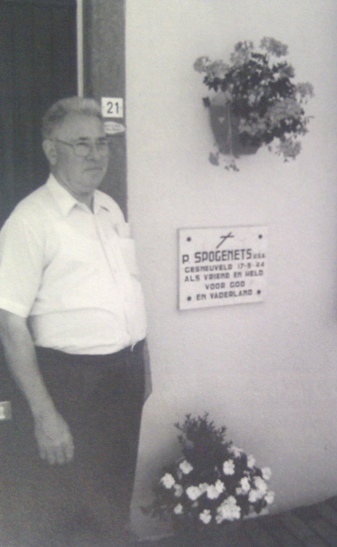 Peter Spoganetz died in front of one of the few houses at the junction of the hamlet Koulen. Dismayed inhabitants asked for his name and when it was applied to them by one of his comrades it was told more or less phonetically to them and misspelled, Thus he became later also chiseled into the marble plaque which to this day recalls the young hero from New Jersey. The plaque on the wall of this house is a tribute to the young American Private Peter Spoganetz. In the hamlet Koulen hell broke loose again "A tank that accompanied the infantry turned in the morning of September 17th ’44 on the intersection from Walem left towards Klimmen, soon from the direction Termaar/Klimmen came in grenade fire and a soldier sitting on that tank was hit in his shoulder". The strange thing was that the grenade didn’t exploded, but rolled into my carpentry workshop. There was the grenade later gingerly removed. But by the power of the grenade the shoulder of that soldier was shattered. Mortally wounded he fell from the tank in front of the Simons house. 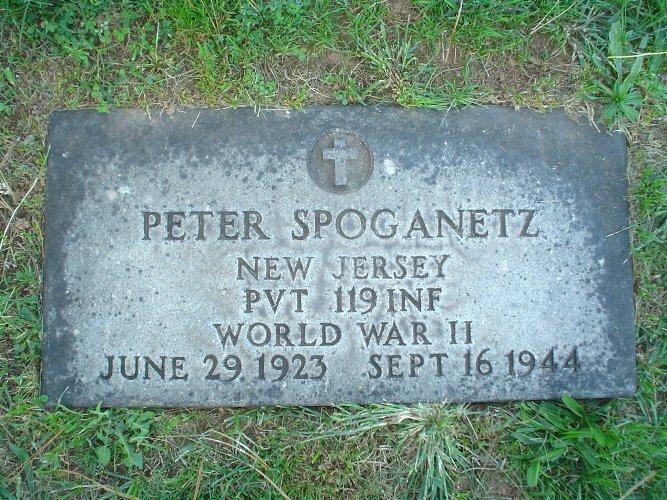 The soldier was Peter Spoganetz. He was later covered with a sheet and laid in front of the Simons house door, later that day Americans had him removed. A few years after the liberation the family of soldier Spoganetz came to visit the place where Peter was killed. Story Harrie Kickken (right), resident of Koulen. 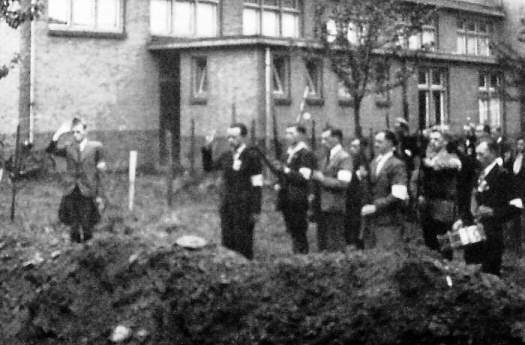 Peter Spoganetz was on 19 September 1944, together with 6 German soldiers buried in a meadow behind the patronaat building in the Houtstraat. (Picture) Members of the Order Police gave last respect to the dead. Begin 1949, the remains were exhumed and elsewhere entombed. Peter was repattriated back to The States and reburied. The Germans are probably reburied on the German Cemetery Ysselsteyn. 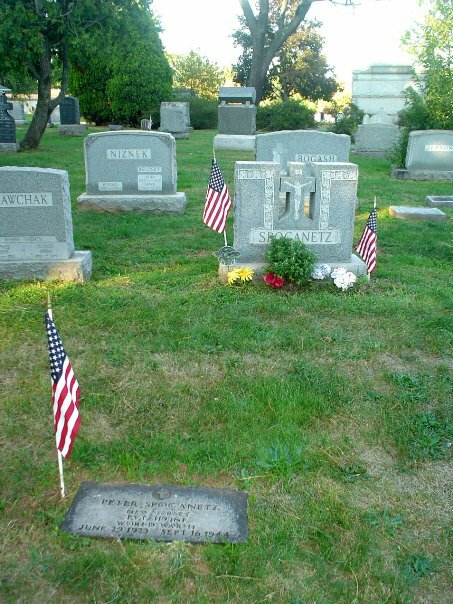 Peter's gravestone on Rosehill Cemetery in Linden, NJ where he on December 16th 1948 was finaly buried. This is the plot for both Peter Spoganetz and Catherine Spoganetz-Olasin (1889-1974). The inscriptions are for "Son Peter" and "Mother Catherine Olasin"